The office clipboard has a good deal of functional documentation, but no API, or operational documentation - I wanted to figure it out, so here's what I've worked out. It may be mildly inaccurate, it may be wildly wrong, but it fits empirically. Microsoft's overview of the office clipboard. A TechRepublic overview of how to use it. As mentioned in the MSDN article, "You can copy items while using any program that provides copy and cut functionality, but you can only paste items into Word, Excel, PowerPoint, Microsoft Access, or Microsoft Outlook." - in order to do this, Office attaches itself to the Clipboard viewer chain, with SetClipboardViewer. Thus, it is notified of any clipboard changes (and can hence receive all items copied in any application, but only paste from the office clipboard while in an office app.). The first office process which starts registers this, with its WndProc as the target. This means any time the contents of the windows clipboard changes, the office process gets a WM_DRAWCLIPBOARD message. The binaries in the office suite forward these clipboard changes to MSO.DLL (a shared office component), which manages a common list of clipped items in shared memory. (If the office clipboard isn't enabled, it ignores this.) The shared clipboard is protected by a mutex, (which I believe is 'MU_ACB08' (not sure, TBD) ). Accesses to this mutex use a 5000ms timeout. Office (inside MSO.DLL) then calls OleGetClipboard to retrieve the IDataObject from the clipboard. If enabled, the tooltip detailling how many items are collected is presented. The limit of 24 items is hardcoded in office, both in terms of an absolute number, and because the buffer that collects this information isn't resizable. 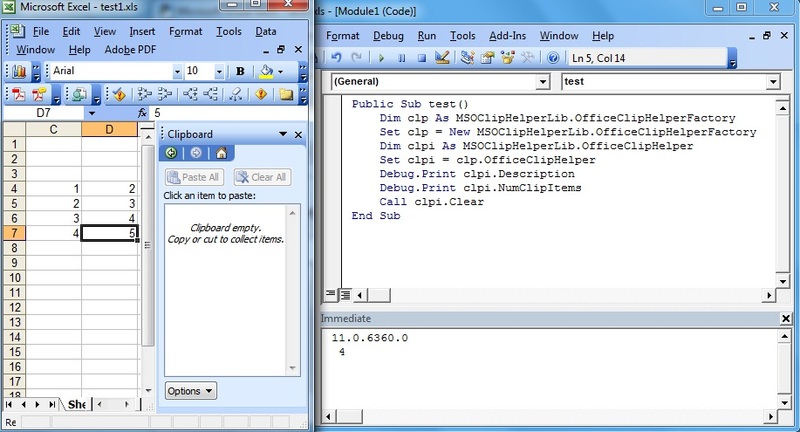 Since MSO.DLL manages the interesting functionality for the clipboard, it's possible to call into MSO directly to perform some manipulation of the clipboard. 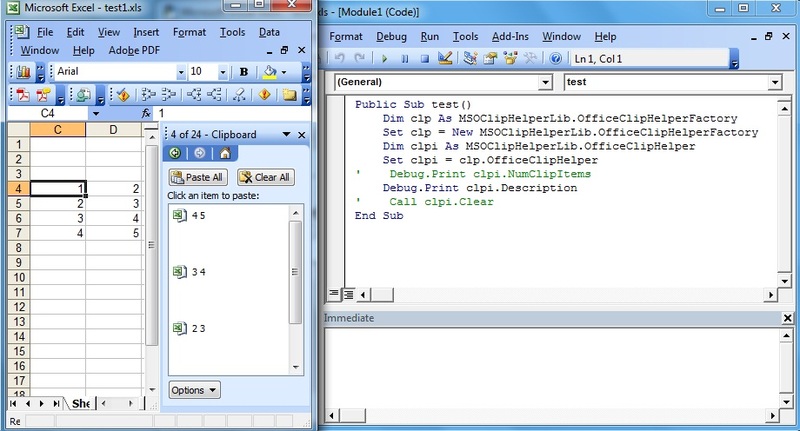 MSOClipHelper provides two objects/interfaces, which can be used to manipulate the office clipboard. Note again, these work for me, and I've tested on several versions of office. But if you're not using a version I've coded for, they won't work. Here, we create an OfficeClipHelper using the OfficeClipHelperFactory - the factory does a one off determination of how to call MSO. We then clear the office clipboard. Get the binary here (com server, so register, then add a reference and use as above). As you might have guessed from the above, I make no guarantees as to the efficacy of this code. Use at your own risk. Ordinals 2959 and 1560 in mso.dll look like they might be useful for a more dependable office clipboard api, however there's other stuff going on which make them less useful (memmoves etc).